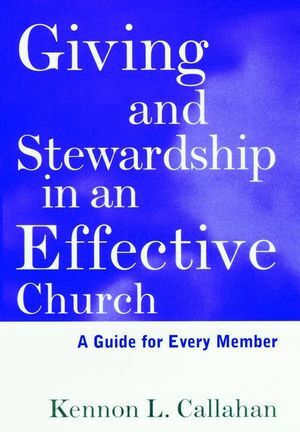 This complete guide to giving and stewardship sheds new light on solid financial resources, one of the 12 keys to building an effective church. Here is a practical plan for the growth and development of giving and stewardship in your congregation, complete with action worksheets that advance the progress of the plan over four years. KENNON L. CALLAHAN, PH.D. ?researcher, professor, and pastor?is one of today's most sought-after church consultants. He has worked with thousands of congregations around the world and has helped tens of thousands of church leaders and pastors through his dynamic workshops and seminars. Author of many books, he is best known for his groundbreaking study Twelve Keys to an Effective Church, which has formed the basis for the Mission Growth Movement, a widely acclaimed program for church renewal. Callahan has earned the B.A., M.Div., S.T.M., and Ph.D. degrees. His doctorate is in Systematic Theology. He has served both rural and urban congregations in Ohio, Texas, and Georgia and taught for many years at Emory University. Ken and his wife of over forty years, Julie, have two children, Ken and Mike, and three grandchildren, Blake, Mason, and Brice. They enjoy the outdoors, hiking, horseback riding, and camping.